Yesterday I came home from work, with about a gazillion things on my mind. I opened my front door and immediately had that feeling like someone had been in my space without me knowing it (isn’t that weird how we can tell?). But my feeling was confirmed when I saw a pair of gloves lying in the passage way – pang of nerves rumbled in my belly. I took a few tentative steps further inside … mmm my computer had been moved, but nothing else looked out of place. Eeeeeeeeeeek. And then I saw it, my brand new shiny herb box sitting on my balcony. Woohoooooo, my radical Christmas pressie from the Wam and the Wad had arrived. A herb box for my balcony filled with wonderful things. 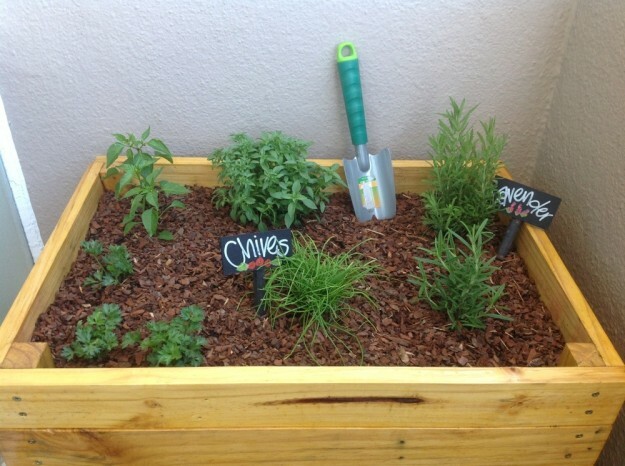 I’ve been wanting a herb garden for ages – not that I have much of a green thumb, I am that person who has a reminder every Monday morning to water her plants! Haha but that does seem to work. Anyhoo, my parents godchild / my little brother makes these herb boxes himself. He’s made a ton for his parents and they caught both mine and my mom’s eye. He makes them in any size and colour you’d like. If you want to get hold of him let me know and I’ll put you in touch. My herb garden is filled with lavender, chili, basil, rosemary, chives and flat leaf parsley. Oh boy am I excited to nurture this and eventually use it in my cooking. Here’s hoping I keep these plants alive! Any good advice on a herb garden?! This entry was posted in Luv and tagged herbs, surprise, the wad, the wam. flip i feel a dinner coming on….with fresh herbs! How bout we just have sushi tonight and herbs next week? That is SO cool! Just water well and feed with seagro occasionally and you’ll be producing so much yumminess from your herb box in no time!! Oooooh, it looks exciting! Get those herbs growing so we can come round for a meal when we’re back. You’ve got 5 months to get some great things growing!!!!! Oooh lucky you too! We have cool moms! Now I just need to keep these plants alive.